Charles Laborde (known as Chas Laborde) was born in Buenos Aires, Argentina, to French parents. He studied in Paris where he was a pupil of Henri Royer and Marcel Baschet at the Académie Julian, and of William Bouguereau and Luc-Olivier Merson at the École des Beaux-Arts. 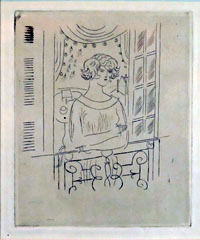 At the age of 15 he began to sell drawings to Parisian satirical magazines. Laborde fought in the First World War and afterwards traveled throughout England, creating a number of biting and humorous illustrations of bourgeois life which were published in Rire Rouge and La Baionette. He established himself as an illustrator, best known for satirical works in which he poked fun at his own world of snobs and aristocrats between the two world wars. 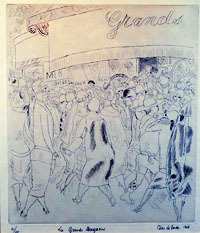 Georg Grosz, the German satirical artist to whom his work is often compared, was a major influence on his work, as was Jules Pascin, who was also a close friend. Chas-Laborde was also much in demand as an illustrator of novels. Throughout his career, his oil painting achieved increasing respect and his work was seen as cerebral and penetratingly witty. 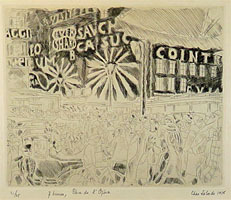 He was commissioned to illustrate a series of books about the streets and faces of famous cities: Rues et Visages de Paris, with text by Valery Larbaud; Rues et Visages de Londres, with text by Pierre Mac Orlan; Rues et Visages de Berlin with text by Jean Giradoux; Rue et Visages de Moscou with his own text; and Rue et Visages de New York with text by Paul Morand, which was published after his death. Laborde was also skilled as a painter and left many portraits, nudes, still lifes, and street scenes which bring to mind Matisse, Kisling, and Pascin, all of whom were influences on his art. He exhibited at the Salon de Tuilieries and the Galerie Charpentier in Paris. A major retrospective was organized the year following his death in Paris. 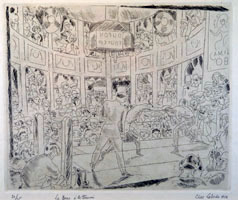 In 1976, the Museum Galliéra in Paris presented an exhibition devoted to his drawings and engravings.